COURT N4 ORDERS ANFI RESORTS REFUND FULL PURCHASE PRICE, DOUBLE DEPOSIT AND LEGAL FEES!! Canarian Legal Alliance is excited to share its newest Anfi Resorts court success. The judge of court N4 declared our clients contract null and void on the basis that they did not follow the correct guidelines as it pertains to its length. Under the Spanish Timeshare Law of 42/98, a timeshare contract must be valid for no longer than 50 years and should be clearly signalised for the benefit of the consumer. Illegal deposit taking was also condemned by the magistrate who ruled all payments made within the first 14 days of the contract must be returned in double. 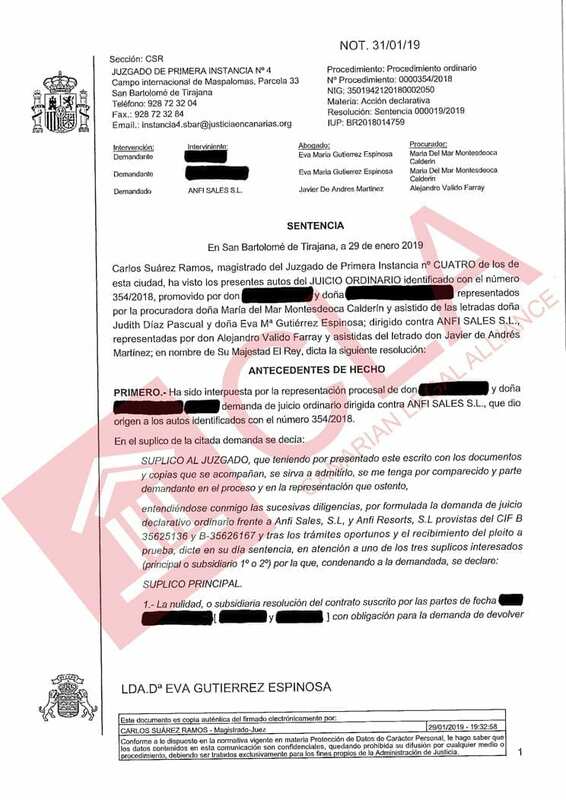 Anfi Resorts has now been ordered to refund our clients over 28,000€ plus full legal fees and legal interest. Congratulations to our clients and to the whole Canarian Legal Alliance legal team. IF YOU WANT TO FIND OUT MORE ABOUT THE CURRENT TIMESAHRE LEGAL LANDSCAPE CONTACT US NOW FOR A FREE CONSULTATION WITH ONE OF OUR LAWYERS.